Postmedia has apologized for a political cartoon that sparked outrage among members of Alberta's Sikh community. On Tuesday, the Edmonton Sun and other Postmedia publications portayed Defence Minister Harjit Sajjan stewing in a cauldron with the label "LIES." Sajjan recently apologized publicly for overstating his role in Operation Medusa, a pivotal 2006 battle in Afghanistan. But critics say the caricature was offensive because it resembles images of historic Sikh religious figures who were tortured. "I was really disgusted," said Harpreet Gill, who is on the executive committee of Gurdwara Siri Guru Singh Sabha, a place of worship for Sikhs. "And then I kind of felt sad as well that a prominent news outlet in the country would do so, and would play with the religious sensitivities of the community who is an integral part of the society here in Canada." Gill said the cartoon bears a "striking resemblance" to the 5th Sikh Guru Arjun Dev Ji, who was forced to sit on a hot plate after speaking up for minorities. He said the cartoon prompted similar criticism on social media in Calgary, Toronto and Vancouver, with demands for an apology. 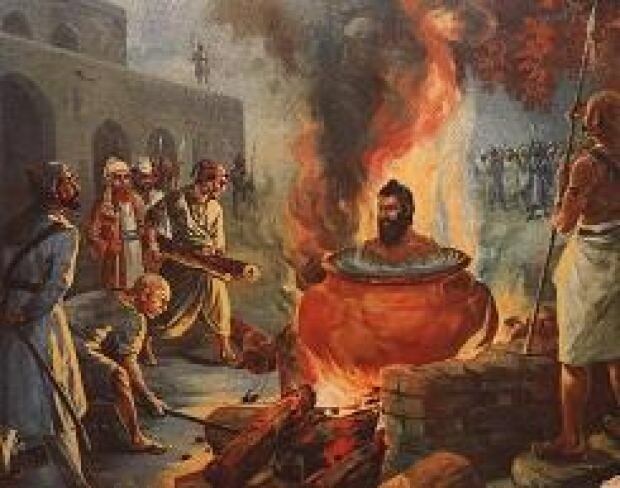 Harmen Singh Kandola, an Edmonton board member of the World Sikh Organization, said the image immediately reminded him of a "famous iconic image from Sikh history" in which Bhai Daval Das, a follower of the ninth guru Tegh Bahadur, was boiled alive. "This cartoon has caused many Sikhs discomfort due to its resemblance to the torture and death of Bhai Dayal Das," said Kandola, explaining Das was persecuted for pursuing religious freedom for another faith group. "While the community feels a lot of pride in fighting for the freedoms of other faiths, they're sacred images for the Sikh community, and to see those images made light of gave us a moment of pause and definitely caused discomfort." Kandola said it was unlikely the author was aware of the image's cultural significance. But he emphasized "it's important to understand that type of context before making such statements, just in order to ensure that they don't cause any unintended consequences." On Wednesday, Postmedia responded to criticism in the Letters to the Editor section of the Calgary Sun: "The cartoon was not meant to insult Sikhs. It was a pun on the minister stewing in his own lies. We're sorry if it was misinterpreted." On social media, an offended Calgarian posted a response he said he received from the Calgary Sun. "It is supposed to be a pun on Bugs Bunny who always ends up in the cauldron in those cartoons. It is supposed to portray the minister in a stew of lies," wrote Jose Rodriguez, who signed off as the newspaper's editor. The cartoonist, Tim Dolighan, did not respond to a request for comment. Gill suggested better representation from the South Asian community in Canadian editorial roles could help prevent future mishaps, because "they would have (been) able to point that out and this could have been avoided."